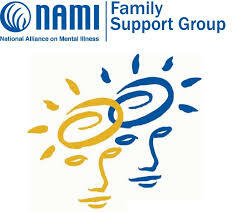 The NAMI Metro Wyandotte Support Group Meetings are held on the 3rd Wednesday of every month. NAMI Family Support Group is a peer-led support group for family members, caregivers and loved ones of individuals living with mental illness. This group meets on a monthly basis. The hallmark of a NAMI support group is leveraging the collective knowledge and experience of the other participants. Meets monthly on the 3rd Wednesday from 10:00 a.m. – 12:00 p.m. and sessions are free of charge. Designed for loved ones (18 and over) of individuals living with mental illness. Facilitated by a trained team of family members of individuals living with mental illness. Confidential — share as much or as little personal information as you want. Does not recommend or endorse any medications or other medical therapies for your family member. Guided by Principles of Support. At each meeting, you review the Group Guidelines and Principles of Support and update the group on the current events in your life, then spend the bulk of the meeting in group discussion, or ‘group work’. The group addresses urgent issues of its members and participants share their learned experience, or ‘group wisdom’. As a participant, your voice is heard, and you can contribute to a dynamic that encourages empathy, productive discussion and a sense of community. The support group can offer you practical advice on addressing issues related to mental illness and your loved one. It also gives you the appropriate space to have your personal needs met so that you can provide the best possible care for your family member. Taking time to voice your experiences and to hear from others may help you develop your inner reserves of strength. You may gain confidence in your ability to cope with your family member’s mental illness as well as local knowledge on how to best access needed services for your family member. Our all-volunteer organization is entirely funded by people like you. Any and every donation counts. Your help can mean help for people and families struggling with mental illness. Sign in here for additional information.